Welcome to your new technology experience. The complex array of high tech equipment running behind the scenes makes it all possible. Keep all of the devices and your network online and optimized with one of our Remote Technology Management Plans. Even with our standard warranty, you get the best service we have to offer. We've been in business for 40 years due to our dedication to the industry as well as our customers. LABOR WARRANTY: Covers all labor, programming, and workmanship for 1 year from date of substantial completion. After 1 year, standard labor rates apply. MATERIAL WARRANTY: Covers concealed wiring, interconnect cables, connectors, wallplates, and other miscellaneous installation material for 1 year from the date of substantial completion. After 1 year, standard material rates apply. MANUFACTURERS WARRANTY: Begins on the date of substantial completion. This program does not extend any manufacturers' warranties. SERVICE SCHEDULING: Phone calls requesting service will be taken during regular business hours. Text messages, emails, and after hours voicemail service requests will be returned during regular business hours. Appointments will be scheduled in the next available time slot. It's never been easier to depend on your network. Our annual plans let you rest assured that we'll take care of everything from network performance to timely maintenance without you having to lift a finger. NETWORK MANAGEMENT: This plan is perfect if you want us to keep your devices and network performing at the most optimal levels, all the time. Our technicians get alerted if your monitored gear goes down. We diagnose and resolve the issue remotely, without inconveniencing you with a visit to your home. ELITE CARE: This is a comprehensive plan delivering all of the power of remote technology optimization and support in addition to higher touch, on-site services. 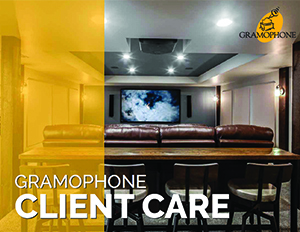 PLATINUM +: Get Elite Care from Gramophone, including after-hours emergency response, no labor billing and concierge contacts. Take a look at the benefits of remote technology management. Tracking of ISP outage ensures that when your ISP is back online, so are you. Get what you pay for from your ISP with regular interval ISP speed checks. We address the ISP with any issues, so you don’t have to. Don’t let your own network be the bottleneck to your high-speed Internet. Save on your mobile data plan and be sure all devices have access throughout your property. We will do what it takes to keep all of your technology online, without interrupting your day. Our technicians are alerted when devices go offline or when services hit certain thresholds. When necessary, settings adjustments can be made remotely to help improve performance. Remote experts have access to resolve issues through power cycling and rebooting of devices. While working hard, your devices collect dust. This can affect performance if not carefully maintained. Moving of furniture or adding decor can change the sound profile and require recalibration. Adjustments to a room can affect video quality. Be sure you are maintaining the best quality possible. See how your network, devices, and remote activities are performing to keep things humming.